Can Guinea Pigs eat Only Hay? Guinea pigs love hay. They need to chew on it all the time so as to keep their teeth ground down and not painful as their teeth are constantly growing. This is a common trait amongst members of the rodent family so they always need to be chewing hay. In fact the greener hay, the more they like it. The more yellow it is, the less they like it. So can Guinea pigs eat only hay? Can guinea pigs eat only hay? They could do but they wouldn’t get a balanced diet. They also need vitamin c which they can get from vitamin c pellets or from certain veggies or fruit. Their diet should be made up of 75% hay and the rest of vitamin c pellets! veggies and fruit topped by a constant supply of water. This way guinea pigs get the nutrients their body needs. So although they love hay and need to eat it every day round the clock, they also need other types of food to give them their bodies what they can’t create themselves. If there’s one thing that guinea pigs are really good at, its eating. They will have a nibble at anything and if like the taste of it, they will eat it. One of the main reasons for this is that their teeth are constantly growing and they need to keep chewing in order to grind down their teeth. So this means that they always looking for things to chew on. So is there a danger that they could over-eat at all? However, fortunately, most guinea pigs are pretty good at self-regulating themselves. They don’t eat all the time and do get full like we do. So it’s important that they always have access to hay to chew on to grind down their teeth as well as vitamin c pellets and fresh water. But just as importantly its good for them to have space where they can run around so as give them the exercise they need otherwise there is a danger they will get quite large. However, there may be some piggies who will overindulge and eat everything that they see. It’s quite interesting to watch then and why they eat. Some will eat all their food and some will leave some of it depending on whether they like the food or whether they are full. I have seen overweight guinea pigs and this can cause problems for them. Just like us they are prone to be lethargic and to other diseases and ailments like Bumblefoot for example. So watching and regulating what they eat is a good practice for the long-term well being of your guinea pigs. A good practice to help this is to regulate what you give to your guinea pigs on a daily basis. As mentioned before most guinea pigs will eat everything you give them especially if they enjoy it. But if you limit what you give them to daily rations then you can stop this from potentially happening. For example, you may choose to give a guinea pig 2 handfuls of guinea pig mix, 3 matchbox sized rations of veg and a little fruit. Don’t forget that hay shouldn’t be rationed. Give them a limitless supply of to chew on and a limitless supply of water as well. You may choose to change this as you see fit, you know your guinea pigs and what they are like. But this guide should help you make a start with this and ensure that your guinea pigs don’t overeat or go hungry either way. Can Guinea Pigs Eat Just Hay? So we know that guinea pigs should eat a lot of hay. It’s an essential part of a guinea pigs diet. They need it to grind their teeth as they pretty much always need to be chewing something in order to grind their teeth. Hay also gives them some of the nutrients that they need to live so is very important to them. Well, they can but it won’t do them much good as it misses out a key element of what they need which us vitamin c. Because their bodies do not make vitamin c they need a regular supplement of it to keep them healthy. If they do not get the vitamin c they need they will gradually get ill, just like we do if we don’t have the vitamins and nutrients that we need. It may be tempting to just leave them be with the hay they need to sleep on and eat, but it really is not good for them. If your guinea pig is only eating hay, try and wean them onto eating veggies as well. Prepare a bowl of veggies for them to eat and leave it in their cage. If they are still only eating hay, maybe reduce the amount of really good green hay they eat and use less appetising hay such as browner hay for their bedding. There does still need to be hay left for them because they always need something to chew on, but don’t leave so much out for them. It is also worth trying different foods to see what they like. I have found that just as with humans, guinea pigs have different tastes to each other so it may well be that you are giving them a food that they are just not partial to. 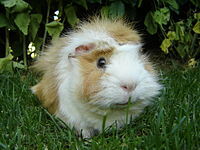 My guinea pigs for example, love carrots and peppers, but do turn their noses up at broccoli and cabbage. But other guinea pigs are different. Also try vitamin c pellets as well. Try scattering some around the hay that they eat so they inadvertently pick it up. If they are not eating hay, it is vital that you try different things to get the vitamin c that they need inside them. 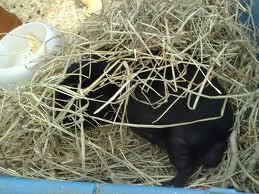 Overall, hay should consist of 75% of a guinea pig’s diet. The rest should be made up of veggies, fruits and maybe some pellets as well, topped up by fresh water. By giving them a balanced diet like this, you are ensuring that your guinea pig gets the nutrients it needs to stay healthy and thrive for the long term.